Thanks in no small part to the groundwork laid by The Black Angels with their Levitation festival (formerly known as Austin Psych Fest), festivals celebrating the wonderfully noisy and nebulous psych genre have been springing up all over the place, both in the US and beyond. 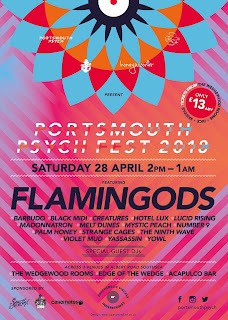 One such gathering of sonic psychedelia is Portsmouth Psych Fest, held in the seaside English city. 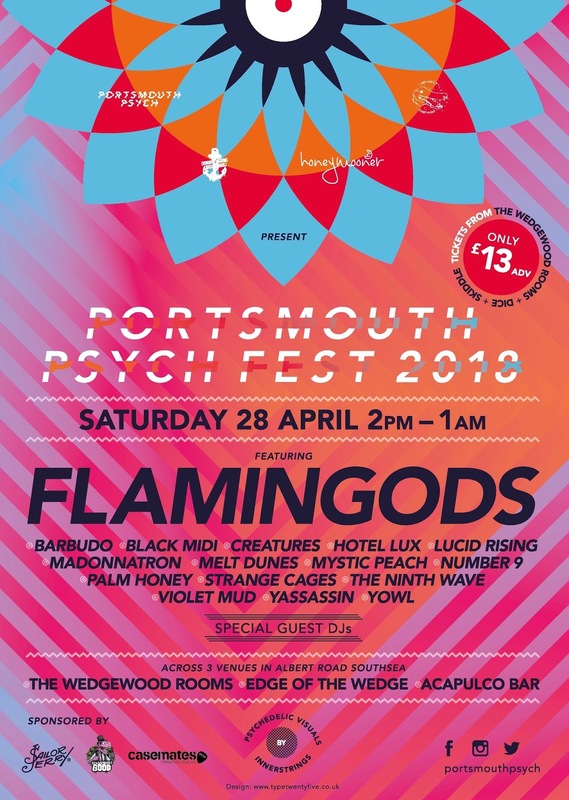 Two weeks from today marks the second iteration of Portsmouth Psych Fest, and it seems to me that this particular festival, helmed by Nicki Allen, has the potential to get bigger and better year after year. Allen kindly took some time from her plotting and planning to answer some of my burning questions, take a gander at those below. And why not check out some of her handiwork and give a listen to the bands on the lineup? This year, the wild and wooly Flamingods headline, with plenty of other tantalizing talent to be found all over the event. Nicki Allen: Portsmouth is where I have lived the last 15 years on and off - it's home! What inspired you to join the ranks of the psych fests? It's the genre of music I am the most passionate about, it's the one I can relate to and and feel inspired by. You've expanded to three stages this year. How big do you see Portsmouth Psych fest getting? We've expanded to three stages, but still using the same original two from last year bringing the capacity up to 600. I think it has great potential to grow even bigger! I would like to take it slowly and build a trust with the punters who remain loyal and welcome new gig-goers each year. How do you put together your lineups - do you approach bands, do you have open applications, or a combination thereof? A bit of both, Each promoter from each stage picks which bands they want and then we chat to see who would work well in which slots. We have bands emailing in asking to play, last year we had Vinyl Staircase who emailed us, we snapped them up and they were fantastic live! Other bands are ones we've been keeping an eye over the year by attending other festivals and gigs in London, Brighton, and Liverpool. What has most surprised you about putting on the festival? Not much really, we know what we are doing, I worked for Southsea Fest for 10 years before starting this on my own, it's in the blood! What, if any, issues from last year's fest did you look to improve on this year? We've added art installations and extra psychedelic lighting this year, as a lot of the punters go to the same venues throughout the year, so it's important for us to keep it visually entertaining as well as watching and listening to the bands. It sets us apart from other local festivals that take place in Portsmouth. What's your ideal festival experience, as a gig-goer? A friendly and exciting atmosphere, gig-goers who are all on the same wavelength to enjoy the music and have a good time with friends. True or false: you've already started to plot for the 2019 festival. True, we already have an amazing headliner in mind!